Today was my anatomy ultrasound and high risk consultation with UT hospital (Lisa Ross sent me there). Needless to say, I was nervous. So nervous that I shot my own heart rate up. I guess they are used to that because they didn’t seem too concerned. I had a couple of “awwww” moments as well as teary eyed moments (thanks, hormones). Little one kept opening his/her mouth and yawning. Once when Harmony cried (she loathed the entire experience) the baby balled his/her hand up in a fist. I guess that should be my sign as to how their sibling relationship will be in the future. Totally kidding…kinda. After that, the obstetrician came in to tell us how everything looked. When I scheduled this appointment through Lisa Ross, they made it seem like the consultation alone would last hours. The doctor walked into the room and said, “Everything looks great.” He then went on to ask about how I was feeling and such…and that was it. That’s not the best part. I don’t have to see a high risk obstetrician again unless Lisa Ross recommends that I should. When he said that I wanted to scream with happiness. As far as I am concerned, I will be having the birth of my dreams at Lisa Ross this time. I will not have a doctor decide the birthday of this baby. I am in my positive zone until further notice. I have also scheduled a birth photographer this time. I didn’t with Harmony because I didn’t think I would want pictures…and now I realize that I do want photos. I am going completely natural this time and I would love to have that story told in pictures. With Harmony, everything felt so rushed, and it kinda was. My mom was able to get a few pictures once Harmony was born, but other than that she was there as support, and that’s exactly what I needed her for. All in all, I am a huge ball of mushy love at the moment, and I apologize to anyone that I make queasy in the span of the next few months. Okay, I’m not very sorry at all. Below are the ultrasounds. 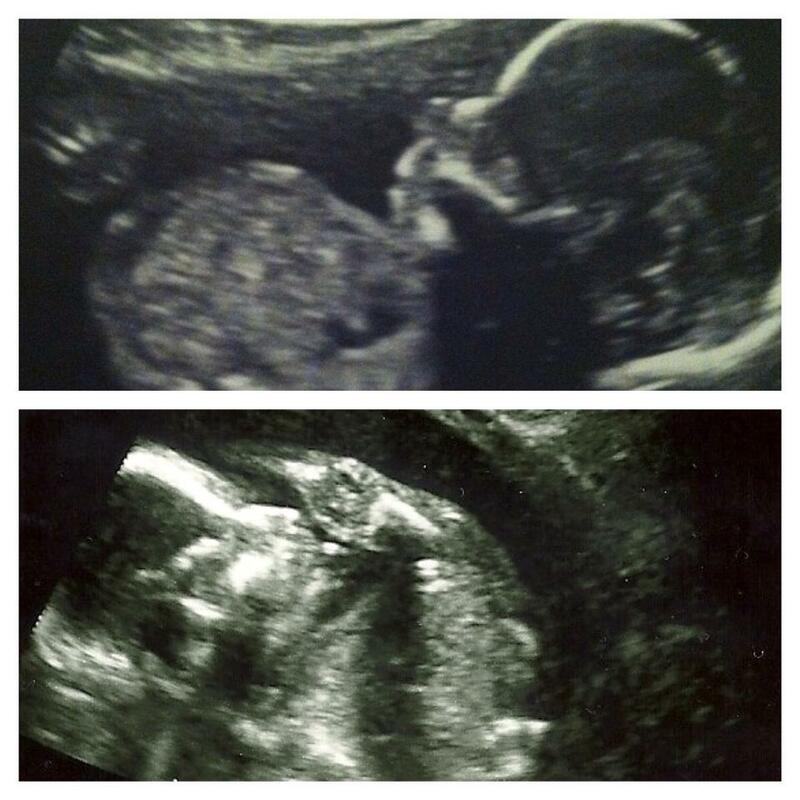 The top one is Baby #2 and the bottom one is Harmony’s at 20 weeks. This baby looks way bigger in general? I feel like my due date may be wrong, personally. I guess we will see. It could just be that Harmony was just a small baby and this one will be a big squish. I wouldn’t mind a big squishy baby, honestly. I’ve seen multiple people post about having 9 and 10 lb boys and I find them adorable. The weight of babies tends to scare women thanks to the misinformation doctors give to us, but I have faith in my own body. I know my body is capable of way more than obstetricians give me credit for. Opinions: based on that top profile alone…can you guess the gender? Jeremy and I won’t know until Saturday, but the suspense is killing me. I’m hoping this baby high I have from finally see his/her face will last until then.